If you listened to last Sunday’s show, you know that EM turned another year older, and so naturally we decided to celebrate by giving away a prize pack of some of her favorite thing. Click for details and good luck! The Giveaway runs through July 2nd. 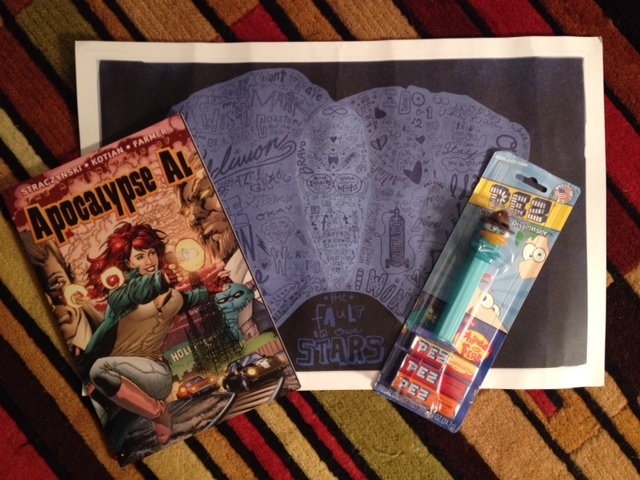 This entry was posted in Giveaways and tagged Apocalypse Al, Comic Books, Comics, Disney, giveaways, Image, It's All Geek To Me, John Green, Perry the Platypus, pez, Phineas and Ferb, posters, TFIOS, The Fault in Our Stars. Bookmark the permalink. ← Episode 41: Con Prep!